The first thing you need to know about fishing is that it requires a lot of patience. Like, a LOT of patience, Gley thought to herself as she stared into the abyss of the underwater fishing cavern in Maraqua. She was sitting on the wooden jetty with her legs dangling over the side. Although she usually wore frilly dresses and had her hair done, she preferred to wear pants and boots and have her hair in a high ponytail while fishing. Gley, a Royalgirl Blumaroo, was well over fishing level 400 and had been fishing for many years. She enjoyed fishing but, on that particular day, the fish weren’t biting and she was getting restless. Her line didn’t even hook onto a loose sea fern, that’s how empty the lake seemed to be. The other fishers that were usually seated on the dock alongside her were long gone, but Gley was determined not to go home emptyhanded. "Looking to hook a big one, eh?" came a voice behind her. Startled, Gley turned around quickly to see who was addressing her. It was the old purple Krawk that was always at the end of the docks. He usually kept to himself, and the only times Gley heard him talk were when he was coaxing his fishing rod to cooperate. He never spoke or joined in conversations with other fishers, even when they were swapping tips and stories. Gley just figured he was a recluse, only there for the fish and not for the social aspect of fishing. She respected him from afar, as sometimes she would also want to be left alone. "Just looking to hook anything, really," Gley admitted, surprised that he was talking to her. The Krawk nodded. "Stubborn one, I see," he said. Gley furrowed her eyebrows, about to call him out on his rude comment, but he continued speaking before she could say anything. "Stubbornness, that’s the best quality for a fisher," the Krawk said thoughtfully. "You remind me of myself when I was younger." 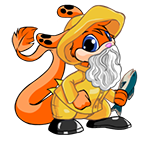 It was late at night and the only Neopians left at the fishing vortex were Gley, the old Krawk, and the Maraquan Grarrl that ran the fishing pole station. The Maraquan Grarrl was watching the two evenly, probably also surprised that the Krawk was talking to anyone. "Um, thank you, I guess…" Gley responded. "How long have you been fishing for?" She would have preferred to be focusing on her fishing rod but, as a ten-time Beauty Contest winner, she was taught to be nice to everyone. "Oh, almost as long as I’ve been alive," he said. "Born on a fishing boat, I’ve been skewering Blandfish and reeling in Large Giant Squid before you were born, I’m sure." Gley nodded politely. She could tell that he was not a great conversationalist, as it seemed he was talking at her rather than with her. "You’re young but you have a true wayfarer’s heart, I can tell," the Krawk said. "I have noticed you on the docks for a long time and I believe you’ve got the makings of a real fisherman. I would like to tell you an old tale if you would hear it." Gley reeled in the last of her fishing line, expertly letting the line float over the still water, avoiding unwanted snags. She smiled up at the old Krawk. "But of course, if you would let me put away my equipment first, please." The Krawk agreed, going towards a rundown rowboat moored to the dock to wait. Gley packed up the rest of her lure and hooks, walking over to the Maraquan Grarrl to deposit her gear. The Maraquan Grarrl reached over the counter to accept Gley’s fishing carrier. He nodded towards the old Krawk. "What did he want with you, Gley?" Gley shrugged. "Seems like he wants to share a story from his past. He says he sees great fishing potential in me." 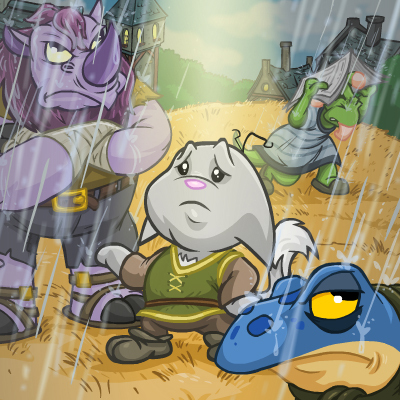 "That must mean something," the Grarrl said. "He’s been here before it was opened to the public and I’ve never seen him talk to another fisher. Listen closely to what he has to say." "Of course, I will," Gley responded. "Have a good night!" She turned to leave, strolling over to where the Krawk was waiting. He nodded to her and motioned for her to sit in the boat. Gley boarded the wooden boat, feeling it rock uneasily under her. "This story is best told in the open waters," he said somberly as he followed suit. Standing on the boat, the elderly Krawk untied the ropes, gave the boat a small push, and then allowed it to move with the current. The two drifted off for a few moments in silence. "How long have you had her?" Gley asked, gesturing to the boat. Although she had enjoyed the water’s silence, she felt as though she had to speak or the Krawk would never tell his story. The Krawk stared across the lake for a moment longer before answering. "Almost all my life," he said. "She’s my second boat, and she’s a sturdy one." "And your first…?" Gley trailed off, wondering if that was a sensitive topic. "I lost her to the sea," the Krawk answered. "During a fishing trip." He sighed deeply and it echoed against the cavern walls as they left the fishing vortex. "Well, young grasshopper, I guess this is a better time than any to tell you my tale." Gley nodded, letting him know she was listening intently. "It must have been forty years now. It was an overcast day and I was not too far from where we are right now, in my first boat. I was by myself when I hooked onto something. Something big. Being the younger lad I was, I was stubborn. I knew whatever I had hooked was too powerful for the fishing wire and the rod I was using, but I refused to cut the line. I set the hook anyway, and the moment I felt the hook pierce the monster, the sky darkened. The clouds that were spread across the sky suddenly came together overhead. I should have known something was wrong the moment the sun scampered away. Nevertheless, I pursued the undersea monster. I was no match for its weight, so I let the line go slack to the ocean floor, letting the monster drag me around the wate. Although it could have crashed my boat along the edges of the Lost Desert or on the shores of Mystery Island, the monster seemed bound to the borders of Maraqua. After being dragged around for thirty minutes or so, the creature seemed to tire. So, and it still hurts me to admit it years after, I let down my guard. I thought it had given up. I tried to pull up my rod to see if the line would give at all. It didn’t. By the time I had reemerged from the surface, my boat was gone. Thankfully, I was marooned close to a small island next to Maraqua. I rested there for the night, keeping an eye out for the beast the entire time. Now, every day I go to the fishing cavern to find any clues about what that aquatic monster could have been." As the Krawk wrapped up his story, Gley felt herself entranced the entire time. Although he was bad at conversation, his storytelling was enrapturing. She blinked a few times, trying to snap back into reality. "So, what have you learned since?" she asked eagerly. The two had been drifting out into the ocean for quite some time now. The sun had long gone but the moon shone brightly, reflecting over the water and illuminating through the dark. "Well… I have yet to learn anything," the Krawk admitted. "I have kept this story to myself all this time. But after seeing you staying late to fish even though it seemed futile, I was reminded how I was when I wrestled that monster so long ago and I wanted to share my story with you, young one." Gley nodded appreciatively. "Thank you for sharing. It is a remarkable fisherman’s tale." Suddenly, a loud noise broke through the night’s quiet. A massive, murky green sesydaslug broke through the surface of the ocean, leaping a few feet in the air. It had a blue tongue and a curled, spiked shell on its back. "GO AWAY!" it shouted, before crashing back into the water and sending large waves towards the small rowboat Gley and the Krawk were in. "That… that noise!" the Krawk exclaimed in disbelief, standing up. "That is what I heard that night so many years ago! That was my beast!" Gley was also staring in sheer shock. The monstrous seaslug that had emerged was larger than anything she’d ever seen before. The two were silent, looking over the water together as waves continued to send the boat further and further from Maraqua. The Krawk looked content, years of mystery finally undone by a chance sighting. Gley gave a weak smile, staring out over the vast water. "The sea holds so many secrets," she said finally.The End. This is a guide to getting the score of 3600+ necessary for the Typing Terror avatar. This game requires typing skill, but mostly luck. There are some things you can do to increase your chances of getting the avatar, however! In relation to the recent plot update! "With an opponent such as "The Boss", victory is not easy. Is it even possible?